PROJECT: Reveal, clean and seal an original Victorian floor which had been covered with Linoleum and Carpet for over 50 years. 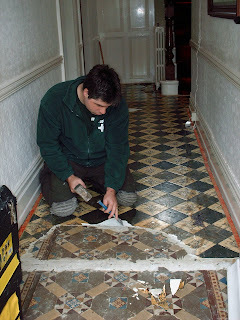 You can see from the pictures that the floor had been covered first with an old plastic vinyl which had been glued down and then later hidden under a carpet. The customer had tried removing the vinyl themselves to reveal the floor but gave up after eight hours and called in Tile Doctor. Removing the Vinyl was arduous work and care was required not to damage the floor underneath; we managed however using a combination of elbow grease, various small tools and a floor steamer. On top of that that we had to contend with the rubber backing which had been stuck down with a strong adhesive. An adhesive removing product we sell called Remove & Go was then applied to the whole floor, covered with a blanket system and then left overnight to let the chemicals to do their work. The next day we removed the remaining rubber and got to work cleaning the old Victorian floor that had now been exposed. Some more elbow grease and a few bottles of Tile Doctor Pro-Clean which is a very reliable cleaning agent soon lifted the ingrained dirt and removed a lot of the stubborn marks from the floor. The floor was then neutralised with copious amounts of cold water and allowed to dry. Final step was to seal the floor using 4 coats of Tile Doctor Seal and Go which not only restored the original colour it also protects the floor for many years to come. The customer was delighted with the results and we felt really satisfied to have been able to restore such a beautiful floor back to its original condition.